Its hard to over-estimate how important this next game is for Ireland. Lets for a second ignore the immediate importance, that of potentially avoiding the Boks at the quarter-final stage of the RWC. There is a much bigger issue at stake – that of the future of the core of this team for the last decade. Since Ireland abandoned 10-man rugby and came out throwing the ball around Croker against Scotland in the 2010 Six Nations, they have looked increasingly frail. That game itself, they were unlucky to lose, but the punters noted a free-flowing strategy of passing laterally, coming off second best at the breakdown and an inability to execute the basics well, like passing to each other. So, in total, 6 wins in 18 games, 4 of them scratchy and 1 very fortunate. However, there has been a consistent tone of optimism emanating from the camp for this entire time, with everything being justified by “wait until Auckland, you’ll see the real Ireland there”. Well, Ireland are now in Auckland (as are Clan Ovale), and the nation now expects a performance, with some optimists expecting more than that. However, what happens if the form illustrated above is more like what we get? What if, as all sensible indicators say, we get thrashed by the Tri-Nations champions? What if this mythical “performance” doesn’t happen? Ireland are going in to the most important game of Deccie’s reign with 5 players just back from injury, 2 locks who look like they would struggle to ruck Shane Williams out of the way, and 2 backs whose form is, to be charitable, desperate. They have no idea who their starting half backs are, and have a captain-in-waiting who scarcely deserves his place in the XV. Plus, the replacement forwards are not of Heineken Cup class, never mind World Cup (and rugby is a 22 man game now). Is this what all the work over 3 years of Deccie has been for? We are feeling pretty pessimistic here, but if the match goes to form, and Ireland get panned, this group of players will find it exceptionally difficult to lift themselves for the Italy match. We are getting the impression that, mentally, all the eggs are in the Wallaby basket. And what will that leave us with? An aged (not ageing) team with confidence and mental well-being in pieces – if Italy don’t finish us off, the Boks (including a ravenous Fleshlumpeater) undoubtedly will. I agree with the post entirely. Kidney's "cute hoor" aproach has blinkered many to his limitations. The Emperor has no clothes. Another gallant defeat to the shackle-dragging breadthieves beckons. However, not wishing to be completely down in the mouth, and in seeing as so many of the underdogs have managed to beat the spread, that's where El G's not-so-hard-earned filthy lucre will be wagered with the satchel-swingers. Struth.I'm still pumped and looking forward to your analysis lads, hope clan ovale had a good few days!Lessons to be taken. 1.A team at 90% mentally right does not equate to a 90% performance, it equates to an 80% performance. For 80% read 60%. Any team not near 100% in the head can be beaten by another good side. Oz weren't right, Ireland were. Do not allow Italy that edge.2.We can be even better than this. As combative as we were, there were a few self doubts about being able to put tries on the wallabies and putting them out of their misery. Lets not put a glass ceiling on where we can go. Focus on ruthless relentlessnesslessnesslessness in attack, the ceiling can be smashed.3.I've read Liam Toland alot lately and enjoy his analysis. He has focused on "what is our style?" Is it Munster or Leinster? Which was it on saturday? It might be worth getting Mike Ross' view on that one! What a game he had. Or even Rory Best's or Fez' opinion. My personal view is that it was just good forward play, it belongs to no-one – fighting for yards and off loading when possible and appropriate. The big question is do you prefer O'Gara steering the ship at the start with Sexton coming on to open the game up, or do you prefer O'Gara as a closer. That is a tough call either way, but ROG for god's sake now is not retirement talking time. He has much to offer now and beyond, if still healthy and comfortable of body and mind. These games are intensely stressful on the two tens, we can only imagine, but we need to respect.4.This may seem silly and the back row may need time to grow into the roles together, but could Heaslip play 7, or is that too big and unnecessary a call? Heaslip (despite not having a typical 7 bodyshape) is our best groundhog of the 3 and that would free O'Brien up even further. Its just a passing thought. The numbers they wear maybe don't mean a lot for the trio anymore anyway.5.My apologies to Court and O'Callaghan, who I have questionned. You could see the drive in DOCs eyes, please retain that true steel and gritty discipline.6.Finally to Kidney and his staff and players, congratulations. They have kept together (certainly at least in public) through the pressure period and the players will have so much more faith in what is being done now they have gotten this reward. Really enjoyed BOD's lack of an OTT celebration-might mean little, but it said a lot. No s******g in nest. Drive it on. Phew lads – what an absolutely incredible performance. Still coming down a little. I was talking to Palla this morning and he seemed a little dazed from it all!Some great points Paddy, lets address them in turn:1. Absolutely correct, Australia looked distracted and unfocused from the start. No doubt the late changes didn't help, but they lacked leaders in the pack, especially in the front five – could Nathan Sharpe have made a difference? We can take lessons there on focus ourselves – and in that, in think its a boon that it looks like it will be all 6N sides in our side of the draw – the distraction of an SH opponent won't be there.2. We will have to be. For all the defensive zeal, Australia are almost uniquely vulnerable to that kind of display – the game was very similar to England-Aus in 2007. That performance won't be sufficient to beat NZ, SA or France, and it will be the minimum requirement to beat Wales and England. We still didn't even threaten to score a try. However, its almost a coaches dream – the limitations were obvious to all (unlike after, say, the England game in March) and should help focus the collective mind.3. Toland has a good point though – the advantage Munster and Leinster (and Ulster of course!) have is that when their backs are to the wall, they have something to fall back on. That isn't something Ireland have. The Leinster lads aren't comfortable going through multiple phases then handing the ball to Rog, and the Munster lads don't naturally seek offloads to straightening carriers. When Ireland aren't playing well, they look totally rudderless. Australia have a similar problem. Its maybe down to limited pool of players? Note that NZ and SA have "styles" but these are pretty much copies of the Bulls and Crusaders (ditto England and Leicester). I'm not sure how this team will cope with a relentless battering from a team that knows its identity 100%. Re Rog, I'm not sure whats going on – the lad has no intention of retiring I reckon, maybe he's aiming for the sympathy starts later this tournament! Or perhaps he re-read his book and noted how his game improved when Humph retired and wants to do the same for Jonny? Psych.4. Well, the crux of your argument is that SOB is a little wasted at 7 and he is bang in form? I agree with that – in fact I would have played Jennings at 7 and SOB at 8 on Saturday – shows what I know!5. Hmmm, I thought DOC was our least effective forward, and the questions over leadership and physicality are still there for me – I can't see him stepping up to Bakkies if the Boks are all over us…6. Absolutely. The squad sem to have genuine togetherness, and really deserve this. Its a just reward for a lot of hard work. Although it isn't over yet as BOD pointed out – if Italy beat us (and everyone gets bp wins vs Russia and the USA) we go out! 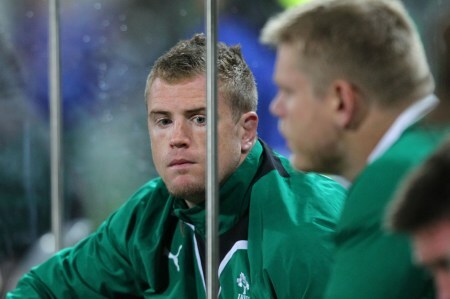 Thanks for that Egg Chaser!I reckon Heaslip is getting a bit of a raw deal out and about. His high standards are maybe counting against him? Really rate Jennings though too and with DR on the bench it surprises me that SJ isn't the back row cover. I have heard Eric Miller praising Leamy as a 7. Can't recall much of him there though myself, though he is a hell of an all round footballer(despite also getting a rough enough ride lately).Not disagreeing with Toland, I'm just genuinely wondering what style it is? I've thought about it a bit more…I remember in 07 as things were unravelling O'Gara said in interviews that he had been on the phone to Deccie and he had said they needed to go back to "Munster cup rugby." Given that as a historical context I was pretty sure they would pick ROG on Saturday and use this as their "default setting." It is a fair indication of the faith in Sexton (and whatever the new gameplan is classified as) that they chose to resist that temptation and go with JS, who lends himself to a more hybrid game. Its fascinating really and I reckon ROG took it pretty tough. I just think that is a mark of how much this is taking out of the two guys. ROG has always been incredible under pressure and has quite amazing mental strength. To me it just goes to show – everyone needs affirmation from time to time, even POC, BOD or ROG. I reckon O'Gara needs a big hug from someone out there, preferably not Fez though as Genia is still feeling a little violated after the hug he got!Having said that, I would push on with Sexton at 10 against the Rouskies. If he is to be the starter, then he needs to run the backline more comfortably and build his goal kicking confidence in this environment. This should be a decent opportunity to do that. McFadden is probably looking at a wing berth? With Darce's injury the 12 question is still hanging a bit and I notice in the distance Jamie Roberts has found some useful form. If Darce doesn't come round who would you take? Fitzgerald? Cave? Dare i say…Downey? Ooooooooooooooooooooohhh James Downey! !He's not going to be picked, but I can make a very coherent argument for him – playing a bosher at 12 will force us to be more patient and set up rucks, not just toss the ball across the field.I think it will be Fitzy probably who will come in, although McF or Wallace shuld play there. Is Dorce that bad though?I agree – having Ryan and Leamy on the bench is POINTLESS. Its fine against a team who do no homework on us, but against a Big Five team it might not suffice.Rog is a big lad, he knows what he is doing – he just isn't first choice right now, these things happen. I've no doubt he will come round, but I thought he'd react better to be honest. I've never seen Wilko in the press feeling sorry for himself. god no, i'm thinking if he doesn't come round from injury – even though they claim scan wasn't too bad, to have to go off with hamburger… didn't look great.